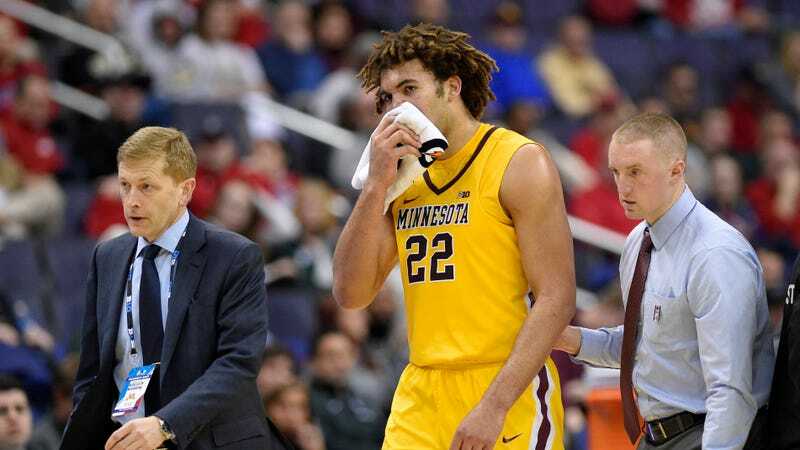 Minnesota center Reggie Lynch was officially suspended from participating in any university-related events until Aug. 1, 2020 after an investigation by the school’s Equal Opportunity and Affirmative Action office found he was “responsible” for an April 28, 2016 “sexual misconduct incident,” according to the St. Paul Pioneer Press. The attack took place in his dorm room, according to the victim. Lynch, a star defensive center for the Golden Gophers, will now be suspended until 2020 unless he successfully appeals the EOAA’s ruling. Although the April incident has largely remained under wraps, Lynch’s entire history of sexual misconduct has not. In May 2016, Lynch was arrested for a sexual assault that also took place in his dorm room; the police ultimately declined to press charges, citing a lack of evidence, and the university, which also looked into it, cleared him as well. Lynch has been on Minnesota’s campus just two years now—he transferred from Illinois State following his sophomore year—but women from both the university and the local community have been outspoken on what they’re claiming has been an ignored threat, by both Hennepin County and the University of Minnesota, in their community. Head coach Richard Pitino is scheduled to meet with the press Friday morning, presumably to explain why Lynch was allowed to remain on the team in light of both the official complaints.